Even before November was in the books, the North Central West Virginia Airport did something it hasn’t done in nearly 40 years. According to NCWV Airport Director Rick Rock, the airport has had the most passengers it’s witnessed since 1979. Rock unveiled the numbers to the Airport Authority, the airport’s governing body, during their Nov. 14 meeting. The numbers of enplanements, or passengers flying out of Bridgeport, had surpassed 30,000 for the year. While that may be good news, the better news is that the totals didn’t include November’s numbers and the numbers that will be created in December. The new total will be revealed at the Airport Authority’s meeting later this month. The reason for the increase are multiple. Rock pointed to the airport’s continued improvement on the financial front as one key reason and said they currently have in excess of $5 million for development. 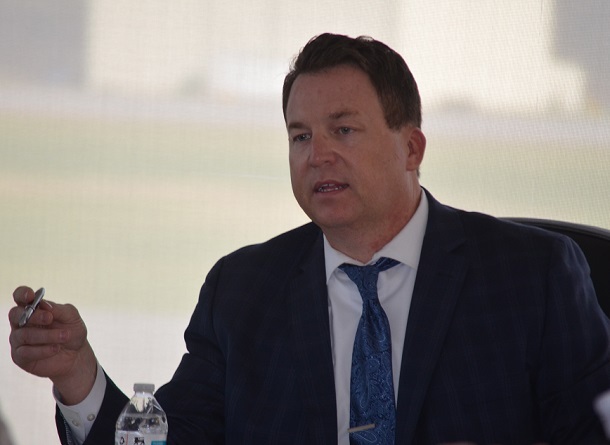 He said that goes hand-in-hand with the increase in enplanements that began with the arrival of Allegiant providing destination flights first to Orlando and then adding a more limited seasonal flight to Myrtle Beach. It would be hard to argue the flights haven’t been successful. Last month was the five-year anniversary of the first flight with Allegiant. Since that time, NCWV Airport Deputy Director Shawn Long said more than 165,000 passengers have flown on their flights from Bridgeport for a total of close to 1,000 total flights. “We’ve done pretty well with Allegiant from both the customer service side and from an operational aspect. It’s been a good five years,” said Long. Long made his remarks during a presentation on the anniversary. He added that the photo on one of the slides showed Allegiant’s MD80 (McDonnell Douglas) aircraft that has come under scrutiny. Long said Allegiant has nearly completed – and will soon completely switch – a transfer to the Airbus A320 that seats 186 passengers, which is more seats than the MD80. Rock added more good news regarding the air service. The daily flight service provider – United Express through Skywest – with flights to Chicago and Washington, D.C. has resulted in 30,000 passengers arriving and departing in Bridgeport. The numbers being shown with the United Express service have been the steadiest since before 9/11. 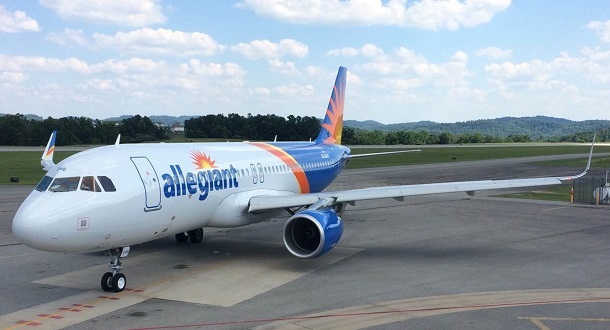 Editor's Note: Top photos shows the new Allegiant Airbus A320 that is now making up most of their fleet and will soon make up its entire fleet, according to NCWV officials. Bottom photo is of NCWV Airport Director Rick Rock at November's Airport Authority meeting.